We didn't expect the Surface Book 2 to drain its battery while plugged in, but it did when we played 3D games. 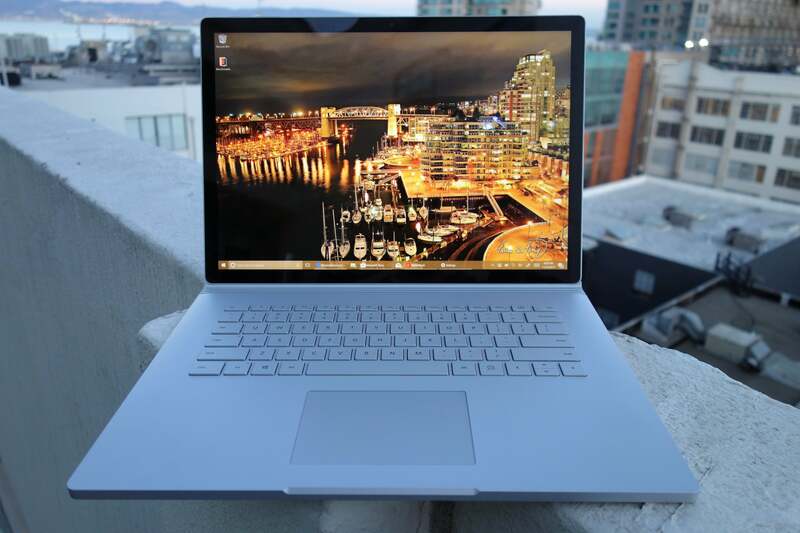 You can understand our confusion, given how Microsoft initially positioned the Surface Book 2. “This is a desktop,” Microsoft’s corporate vice president of devices, Panos Panay, went so far as to call it. “For many, this is likely the most performant desktop they’ve ever seen.” Most models come with a discrete Nvidia GTX 1060 GPU (the lowest-end model has a GTX 1050). At the launch event, Microsoft showed off Cuphead and Gears of War 4 playing at high frame rates on the Surface Book 2, implying that it was capable of playing PC games. However, our review of the 15-inch Surface Book 2 revealed two surprises: Under heavy load, our unit drew so much power that it tapped into the battery even while charging on the Surface Dock. 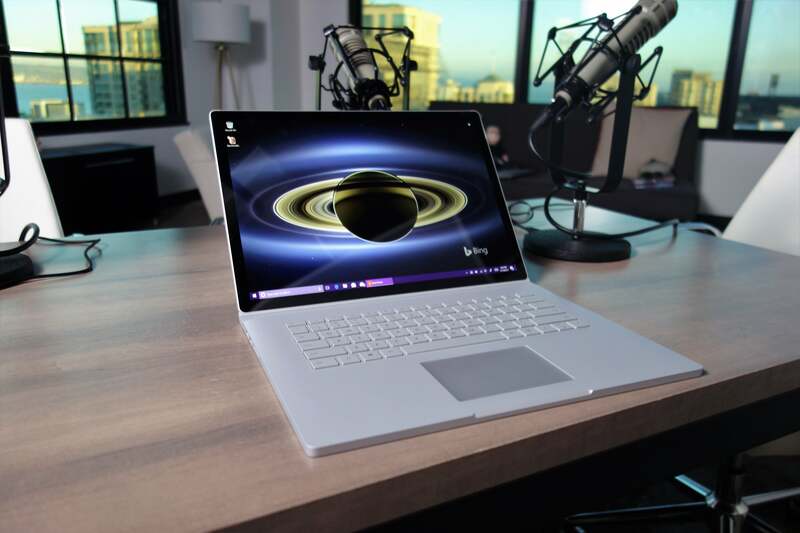 Thanks in part to The Verge’s Tom Warren and his own Surface Book 2 review, we also know that the Surface Book 2 may pull too much power when connected to the stock charger. When pushed too far, we observed that the Surface Book 2 throttled its performance to stay back from the brink. What this means for you: Anyone who spends more than $3,000 for a laptop understandably would expect to receive all of the performance they’ve paid for. What seems to be happening with the Surface Book 2 is a disconnect between what the laptop could do and what Microsoft allows it to do. Some early Surface Book users could wind up being pretty frustrated. The excessive power draws occur only under a specific condition: when Windows 10’s Power Mode Slider (a feature you’ll see more of in the Fall Creators Update) is dialed up to "Best performance." This slider, accessible via the taskbar, provides three increments of battery/performance: “Best battery life,” “Best performance,” and a midrange setting. Though we’ve never tested the slider’s specific effects, anecdotally I’ve found that Windows typically auto-adjusts it for battery or AC power, tweaking the performance accordingly. Microsoft confirmed the purpose of the slider. "The Surface Book 2 Power Mode Slider is provided as a means to give the user control over the range of performance and battery life," a spokesperson explained. The “Best performance” setting triggers differences in the GPU clock, and a notable increase in fan speed and audio volume. It’s a setting that’s not usually enabled, but with the Surface Book 2’s discrete GTX 1060 GPU, it’s likely some users will enable it for gaming to unlock the laptop’s full performance—and that’s exactly what we did in testing the Surface Book 2. It’s important to note that the Surface Book 2’s “normal” state, even when plugged in, pegs the Power Mode Slider in the lowest-power, lowest-performance state. Yes, the GPU turns on, the fan runs quietly, and the performance and battery life are high enough to generate rave reviews—but it’s not all the performance that the GPU can deliver. It’s when you adjust the performance higher that things get interesting. Each performance increment appears to make adjustments to the GPU clock speed and fan speed. Provided that the GPU is already “warmed up,” so to speak, flipping the slider to the midrange setting dials up the fan noise. The maximum setting ramps it up even further, to the loud “whoosh” most gaming notebooks provide. It’s at this point—the maximum setting—that the Surface Book 2 begins tapping the battery for extra power, proof that the charger can’t keep up. For reference, Microsoft labels the charger as a 102-watt charger, though its rated output is 1.5A at 120 volts. 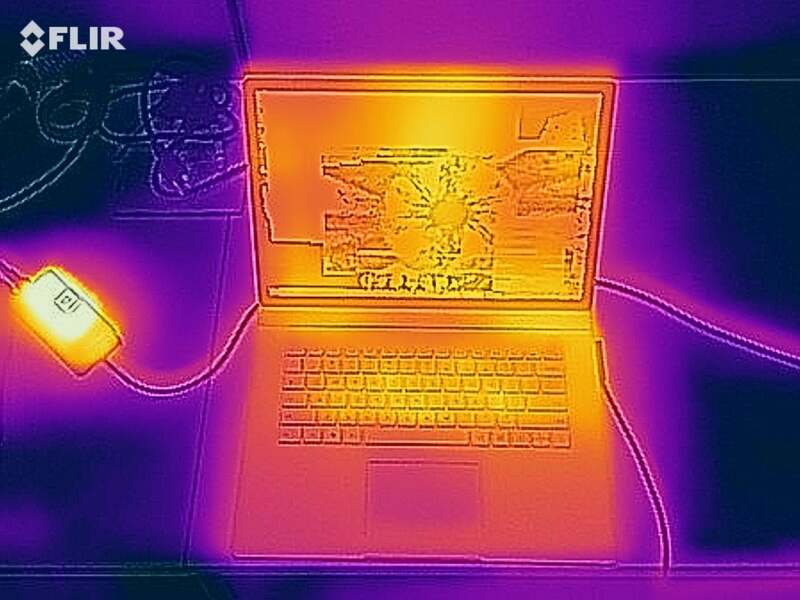 Based upon a power meter we connected the Surface Book 2 too, it draws 101 watts from the wall. For testing purposes, we wanted to establish a consistent load on the CPU and GPU, rather than the on-again, off-again workloads of games and other apps. 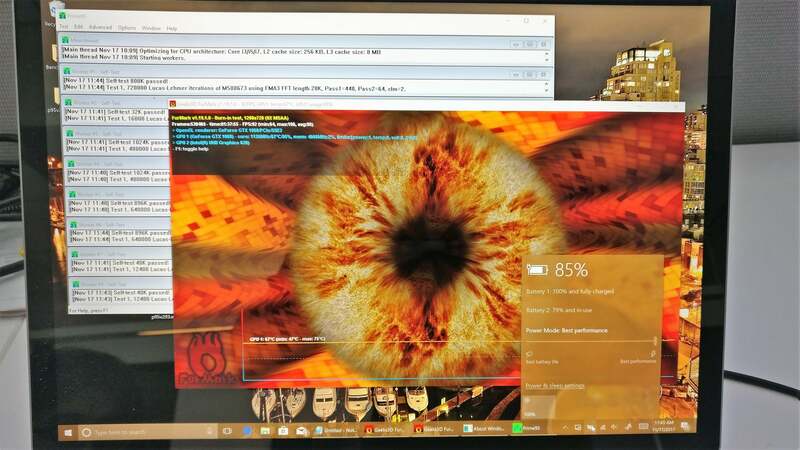 We used the FurMark graphics benchmark/stress test in a 1280x720 window, in conjunction with the Prime95 CPU stress test. After an hour and 45 minutes of prolonged stress testing, the overall battery state had dropped by 15 percent, as shown here. As a control, we also we also set up a Gigabyte Aero 14 with a Core i7 7700HQ and a GeForce GTX 1060, similar to what’s inside the Surface Book 2, and ran the same stress tests. The difference was the charger: the Aero used a 150W power brick, and suffered no battery drop or performance loss as a result. But the Surface Book 2 also had one last wrinkle for us. By default, at its highest-performance mode, the Surface Book 2’s Nvidia GeForce GTX 1060 chip runs at about 1.4GHz. After a few hours, the Surface Book 2 throttled it back to about 1GHz—enough that the Surface Book 2 stopped dipping into the battery, but also stopped delivering the sort of performance that the Aero did. The Surface Book 2’s problem seems to boil down to this: Its charger doesn’t supply enough power to charge the Surface Book 2 while under load—which, for our purposes, means games. If you’re using Office or browsing the web, or even working intermittently in Adobe Creative Cloud, you may not see a prolonged drop, given the relative infrequency of accessing the GPU. On the maximum power settings, though, you will—until the built-in throttling kicks in. In discussing our findings with Microsoft, the company seems to be backing off any implication that the Surface Book 2 could be considered a gaming machine. "Surface Book 2 was designed to deliver unmatched power and performance for anyone who needs a powerful machine to work and create, making it a great option for STEM professionals (designers, developers, engineers)," Microsoft said in a statement. What we found doesn’t detract from the Surface Book 2’s cosmetic appeal, but it does smudge its reputation as the “ultimate notebook”. Ironically, there is a solution to the problem: Nvidia’s Max-Q technology, which includes “optimizations such as a low voltage optimized clock curve that wrings out gaming performance while reducing power,” according to Nvidia. But the Surface Book 2 doesn’t include a Max-Q chip, at least not yet. It seems odd, though, that a premium device would have this compromise. Is this a defect, or something else, such as the inability of Surface I/O-power connector to pass enough power? We simply don’t know. Whether Microsoft plans to recall and replace the current power brick, and design a higher-power Dock, remains to be seen. For now, we’re holding our Surface Book 2 review score steady at 4 stars, while we give this some thought. But we're certainly disappointed, as we suspect potential Surface Book 2 buyers will be, too.